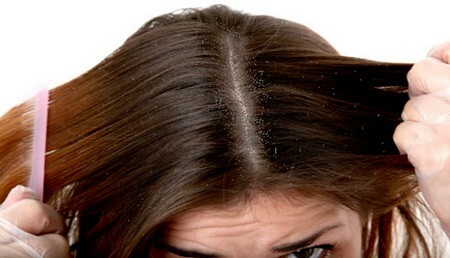 Dandruff is an annoying skin disorder of the scalp that causes itching. Itching itself is annoying enough, but when you itch, you dislodge those dreaded white flakes. While dandruff may not be life threatening, it can be persistent and frustrating. You have 2 choices when it comes to dandruff. You can cure it with expensive, store-bought products or you can cure it naturally and inexpensively, using items commonly found at home. Improve circulation. Brush clean hair every day to improve circulation and remove any dandruff flakes. Bend forward at the waist with your head pointing down at the floor and brush your hair, starting from the nape toward the top of the head. Massage your head with your fingertips before or immediately after brushing to further improve circulation. Keep your scalp clean. There are several ways to naturally get rid of dandruff buildup. One way is to dilute cider vinegar with an equal amount of water and dab onto the scalp with a cotton ball. Witch hazel, undiluted, can be substituted for the cider vinegar and water if you have it on hand. If you prefer a method that doesn’t sting, use undiluted coconut oil. Massage the coconut oil into the scalp with fingertips or a brush, then rinse the scalp with hot water-or as warm as can be tolerated-for up to 15 minutes. This method will keep your scalp dandruff free for up to 6 months. Change your eating habits. If you’re healthy on the inside, it will show on the outside. A well-balanced diet that includes raw vegetables and fruits will go a long way toward getting your dandruff under control. Some dandruff sufferers say that eating nothing but fruit for three-day intervals helps cure dandruff. Rinse your hair with a mix of water and 1 teaspoon lime juice during the final rinse of your shampoo. This will not only prevent dandruff, it will give your hair a really nice shine. Try an overnight treatment for long lasting relief from heavy dandruff buildup. Apply baby oil to your entire scalp at night before bed. Cover your head with a towel to protect bedding. In the morning, shampoo with a natural shampoo. This process may need to be repeated until the dandruff is gone, but it will get rid of dandruff for months. Two benefits of this cure: It doesn’t burn the scalp and baby oil is inexpensive. Another overnight remedy commonly used in India is to mix 1 tablespoon of olive oil with 1 teaspoon of lime juice and then massage into the scalp with fingertips before bedtime. Wrap a towel around your head to protect bedding. In the morning, shampoo with a natural shampoo. Relax. Believe it or not, stress and anxiety can cause dandruff. Get enough sleep and don’t sweat the small stuff. How to Cook Chicken Drumsticks?